^ a b c d e Lee, Sang-im; Parr, Cynthia S.; Hwang, Youna; Mindell, David P. & Choe, J.C. (2003). 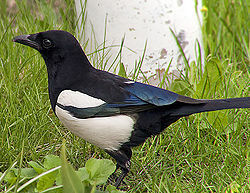 “Phylogeny of magpies (genus Pica) inferred from mtDNA data”. Molecular Phylogenetics and Evolution 29 (2): 250–257. doi:10.1016/S1055-7903(03)00096-4. PMID 13678680.